Tonight: Evening sprinkle, otherwise partly cloudy. Mid/upper 30s. 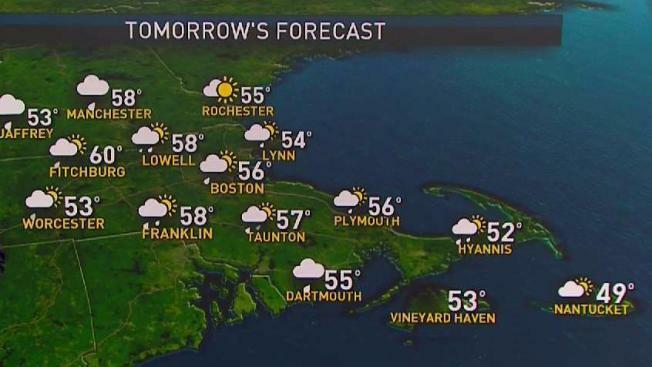 Thursday: Some early sun, developing afternoon showers. Upper 50s to near 60. Friday: Milder! Partly sunny. Upper 60s to near 70. Some of the same atmospheric moisture that caused morning fog and black ice will make itself evident again this afternoon and evening in the form of bubbling clouds ahead of an approaching disturbance and a push of milder air. Late afternoon and evening brings sprinkles and a few light showers to New England with snow showers in the mountains of northern New England. Snow showers in northern New England will persist into the night, dropping only a grassy dusting for most, though a coating to an inch is possible in the mountainous terrain. By Thursday morning, sun briefly returns ahead of another push of warmer air — a warm front — meaning another push of clouds and showers advancing from west to east Thursday afternoon and evening, most consolidated in the northern half of New England and more scattered for Southern New England. The warm front will deliver temperatures in the 60s to southern and central New England Friday afternoon with a few developing late day showers, but will have trouble pushing through the mountains or up the coast of Maine where cooler air will hold highs in the 50s with developing light rain. As Friday wears on, the warm front stalls, becoming stationary and separating cool air to the north from warm to the south, resulting in a big difference on Saturday from cool and showery weather north to warmer and brighter weather south, where some highs should push through the 70s! We’re watching for wiggles in the stalled frontal boundary, though, and believe northern and especially northeastern Massachusetts may dip cooler Saturday afternoon, with all of New England turning chilly Sunday as showers move in. Rain should fall heavily Sunday night into Marathon Monday with highs in the 50s, meaning hypothermia will be a concern for some runners. Midweek next week brings drying and 50s in the exclusive Early Warning Weather 10-day.